It has come to my attention of late that there are a few companies out there now that make lactose-free Greek yogurt. This means that there are a couple of dishes that used to be in my regular repertoire that I had to drop when I was diagnosed as lactose-intolerant, but I can now add them back to my regular rotation. 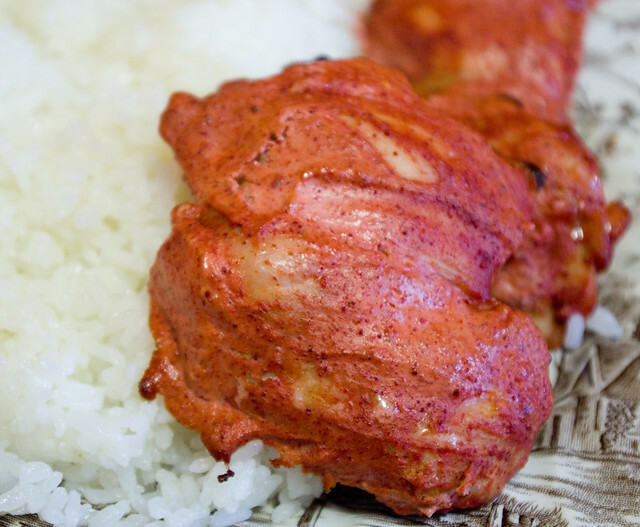 The first thing I wanted to try was tandoori chicken thighs. I know that for a proper tandoori dish it should be baked in a traditional tandoor oven, but that’s just not something that I have available. Instead, I combined Pataks Tandoori Curry Paste with some of that lactose-free Greek yogurt to create a marinade, and I left the thighs in in it overnight to absorb the flavour. Then I baked the chicken on a broiler pan in my regular oven. It was very tasty and packed with flavour, if a little bit sweeter than I’m generally used to. That’s because somehow I didn’t read the yogurt label properly and bought vanilla yogurt instead — and I didn’t realize until after I’d already put the chicken in the marinade. I’m actually rather surprised that it still tasted pretty good, but it did! 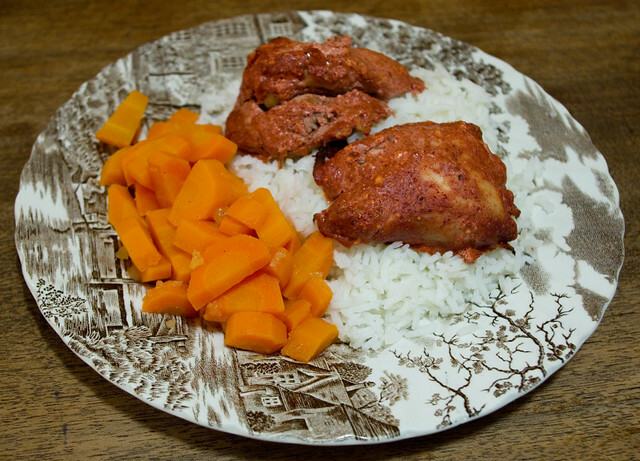 I served the chicken over steamed basmati rice and alongside glazed carrots. I steamed the carrots in the microwave and then tossed them with a bit of my carrot jam, just enough to coat the veggies. Carrot jam is really great as a glaze on steamed or baked root vegetables, and it’s also surprisingly good used to glaze pork roast.